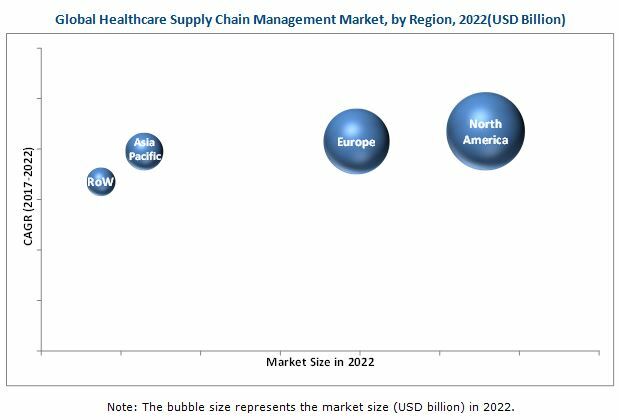 [152 Pages Report] The global healthcare supply chain management market is projected to reach USD 2.31 billion by 2022 from an estimated USD 1.41 billion in 2016, growing at a CAGR of 8.4% during the forecast period. 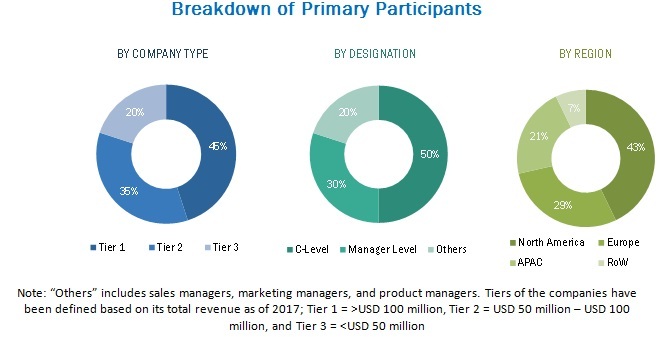 Increasing pressure faced by healthcare providers to improve operational efficiency and profitability, emergence of cloud-based solutions, adoption of the GS1 system of standards in various countries, and growing focus to curb the large-scale counterfeiting of drugs in the pharmaceutical industry are driving the growth of this market. Healthcare supply chain management is the vital practice of developing efficient supply chain methods to achieve operational efficiency and traceability while reducing operating costs without compromising quality. The healthcare expenditures in major markets across globe have witnessed a significant increase in the recent years, and this trend is expected to continue in the coming years. For instance, according to the Centers for Medicare & Medicaid Services, the national health expenditure in the US is expected to reach USD 3.5 trillion in 2017 (including USD 360.1 billion spent on prescription drugs; USD 63.7 billion spent on non-durable medical products; and USD 53 billion spent on durable medical equipment). An efficient healthcare supply chain is majorly responsible for the accurate, safe, and efficient movement of medications and medical supplies from manufacturers to users. Thus, the supply chain process in healthcare is critical for delivering quality patient care, increasing efficiency, and controlling costs. Considering such developments, the growing pressure on healthcare providers to increase efficiency while reducing costs is encouraging the adoption of healthcare supply chain management solutions across the globe. To track and analyze competitive developments such as agreements, collaborations, and partnerships; product launches and enhancements; expansions; mergers and acquisitions. Product Matrix, which gives a detailed comparison of the product portfolios of the top three companies in the market. The global healthcare supply chain management market is projected to reach USD 2.31 billion by 2022 from an estimated USD 1.55 billion in 2017, growing at a CAGR of 8.4% during the forecast period. Increasing pressure on healthcare providers to improve operational efficiency & profitability and the emergence of cloud-based solutions are the key factors driving the growth of this market. Healthcare supply chain management is the practice of developing efficient supply chain methods by stakeholders in the healthcare arena to achieve operational efficiency and traceability while reducing operating costs without compromising quality. The adoption of healthcare supply chain management solutions offers significant benefits to various stakeholders involved in the supply chain, such as healthcare providers, distributors, and suppliers. Globally, there is an increasing focus among stakeholders to reduce their operating costs by achieving operational efficiency. The adoption of supply chain solutions helps them achieve these objectives, and thus the demand for these solutions is increasing across the globe. 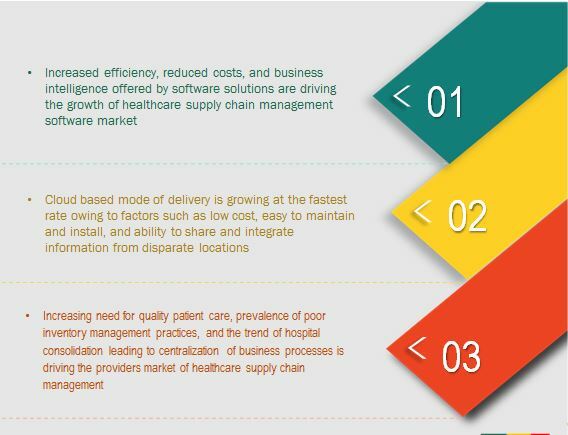 The healthcare supply chain management market has been segmented, on the basis of component, into software and hardware. The software segment is expected to command the largest share of the healthcare supply chain management market in 2017 due to the benefits it offers, such as, increased efficiency, reduced costs, and business intelligence. The healthcare supply chain management market North American market is expected to grow at the highest CAGR in the forecast period. The large share and high growth rate can be attributed to factors such as consolidation of hospitals, regulatory requirements, rising prevalence of chronic diseases, increasing patient burden in the US, and implementation of various strategies to improve healthcare supply chain management in Canada. Various functions of healthcare manufacturers, such as data analytics of sales, pricing alignment, inventory management, implantable device supply chain management, and master data management can be simplified by using healthcare supply chain management software. These solutions provide and derive accurate market information and help in making critical business decisions. Pricing discrepancies, overpayment of commissions, and distributor rebates can also be reduced by using these solutions. To efficiently coordinate between manufacturers and providers, primary pharmaceutical distributors and GPOs require supply chain management tools and solutions (software/hardware). Efficient inventory management is a must in GPOs as they store goods in warehouses. The tracking and tracing of goods in these warehouses is very important for this end-user segment due to the frequent transfer of goods. Many pharmaceutical distributors and GPOs are also entering into partnerships with the providers of supply chain management solutions to manage inventory better. What are the upcoming applications for healthcare supply chain management solutions? High costs associated with the implementation and maintenance of healthcare supply chain management solutions limit the adoption of these solutions in the healthcare arena, thereby restricting the market to some extent. The efficient use of healthcare supply chain management solutions demands significant investments by hospitals and pharmacies. Small to medium-sized hospitals and pharmacies find it difficult to afford such systems as they have controlled budgets and cannot justify long payback periods. Furthermore, the implementation time of these software solutions can take as long as several months. This is a major concern as many hospitals are not comfortable operating for such long periods without their ongoing minimal IT support. Key players in this market include SAP (Germany), Oracle (US), Infor (US), McKesson (US), TECSYS (Canada), are leading players in the market. Other prominent players include GHX (US), Manhattan Associates (US), JDA Software (US), Jump Technologies (US), and LogiTag (Israel) are some of the major players operating in the healthcare supply chain management market. These players are increasingly undertaking mergers and acquisitions, and product launches to develop and introduce new technologies and products in the market.